Melbourne-based retailer The Just Group has implemented a Bluetooth wireless stocktaking solution for its network of clothing stores Australia-wide. The RapidStocktake solution, claimed to be a world-first by its developer Dematic Real Time Logistics, does away with both Wi-Fi and laser scanners to streamline an unreliable batch process. The Just Group has about 1000 clothing stores around Australia under well known brands such as Just Jeans, Portmans, Peter Alexander and Jay Jays. Its twice-yearly stocktake was labourintensive and required stores to close until the process was complete. For 10 years, the group has used portable data terminals (PDTs) with integrated laser scanners in a batch process. Stocktaking typically required four terminals to be sent to each store. 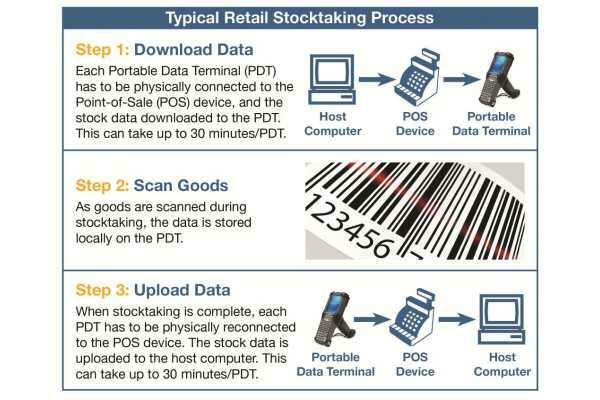 After connecting each PDT to the store’s point-of-sale (POS) register to download the data for the stocktake, staff scanned and collected the stock data in the store using the terminals. When stocktaking was finished, the retailer had to reconnect the PDTs to the store’s POS register one at a time. The data was then uploaded to the group’s servers. Dematic account manager, Rizan Mawzoon, said the companies reviewed several options to make the process wireless and eliminate the need to connect each data terminal to the POS register. “However, wireless networks normally require the installation of a WLAN and, with close to a 1000 stores, this would have added significant expense to the project,” Mawzoon said. Dematic worked with Motorola (smart scanners) and retail software company Bizcom to use Bluetooth for wireless data transfer within the stores. “The big benefit of using the MT2000 series handheld mobile terminals with Bluetooth was that we didn’t need to install any WLAN infrastructure, which made this option very cost-effective,” Mawzoon said. By connecting a Bluetooth base station to the POS register, The Just Group can now download the necessary data at the start of the process and wirelessly transfer it to all of the smart scanners concurrently. Data from the smart scanners is wirelessly transferred to the base station connected to the POS register, then uploaded to the host computer in a single transaction. The Just Group project manager, Daniel Dunstan, said RapidStocktake has reduced the time required to complete a typical stocktake from about three hours to less than two. “The new smart scanners are equipped with image rather than laser scanners, and this makes the task of reaching into a rack of clothes and scanning tickets a lot easier and quicker for our staff,” he said. “With the old laser scanners, staff always had to make sure the ticket was level while scanning to ensure the barcode would read correctly. Now, with the smart scanners, they don’t have to struggle to try and get the ticket in a certain position to ensure it reads correctly, as the image scanners are much more forgiving than laser scanners.” Dunstan expects labour savings of about four man hours per store. Reduced shipping costs are an added side benefit; the old PDTs were weighed in at about 15 kilograms while the new ones are only six kilograms. Dunstan estimates freight costs to reduce by about a third. The Just Group’s stocktake manager, Ken Dobeson, said the use of Bluetooth was an “innovative and very effective” solution. “Bluetooth is ideal for use in our stores as it is an effective wireless data transfer method in enclosed spaces,” Dobeson said.